To maintain the global water balance, evaporation from oceans worldwide must be balanced by precipitation into the oceans plus runoff from the continents. Earth's atmosphere contains only 0.001 percent of the Earth's water, yet it is an essential component of the global hydrologic cycle: currents of air carry water vapor over land, and the resulting precipitation enables life on land. Increasing atmospheric concentrations of greenhouse gases , mainly carbon dioxide, have led to a warming at the surface, by nearly 0.6°C (1.0°F) during the twentieth century, and it is widely believed that this trend will continue in the twenty-first century, leading to a higher sea-surface temperature, among other factors. One intuitive consequence of a warmer ocean surface is a larger vapor-pressure difference between the sea surface and the adjacent atmosphere. This would enhance the evaporation rate, and hence increase the other components of the hydrologic cycle. Numerous empirical observations and models of the global climate confirm the hypothesis that global warming enhances the global hydrologic cycle. For instance, a global warming by 4°C (7.2°F) is expected to increase global precipitation by about 10 percent. Models suggest that the increase is more likely to come as heavier rainfall, rather than as more frequent rainfalls or falls of longer duration. Second, radiosonde (balloon-borne instrumentation) and satellite data suggest that the mean (average) atmospheric water-vapor concentration has increased. This enables storms to generate more precipitation. Third, precipitation amounts have changed in different ways in various regions during the last 80 years, but they generally have increased in the middle and high latitudes, often in excess of 10 percent. In the United States, annual rainfall has increased by about 10 percent during the twentieth century, on average. The largest increases in precipitation are expected to occur near polar regions, for two reasons. One, observations and climate models indicate that the warming rate has been and will continue to be the highest there, and warmer air can hold more water vapor. Two, the warming will reduce the extent of sea ice , thereby allowing more evaporation from open water. Changes in rain events, such as monsoon rains, can have either beneficial or detrimental effects: namely, decreased rainfall can cause water shortages, and increased rainfall can aggravate flooding. 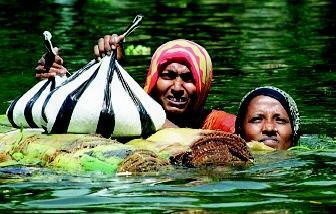 These women in western Bangladesh float food packs on a raft during monsoon flooding in 2000 that affected more than 2.5 million people. The potential impact of global warming on monsoon circulation is unknown. plagues the African Sahel region more than ever before. Yet in the tropical Pacific, the sea-surface temperature, evaporation rate, and rainfall amounts all have increased. Fourth, the observed increase in precipitation in the last few decades has been due in large part to a disproportionate increase in heavy and extreme precipitation rates. This is consistent with climate model predictions. Fifth, an increased intensity of storms associated with atmospheric fronts in the Northern Hemisphere has been observed over the past few decades. Sixth, on a longer timescale, ice cores drilled on the ice sheets of Greenland and Antarctica show that during the last glacial maximum, 20,000 years before the present (BP), there was more dust in the air. There is other evidence that suggests that global precipitation amounts were lower during the Ice Age. Apparently the hydrologic cycle intensified after the Ice Age, and more aerosols were washed out before they could settle on the ice sheets, explaining the cleaner layers of ice in the ice cores after 20,000 BP. Finally, more rain tends to fall if the monthly mean (average) temperature is above normal, as shown by observations in the United States and in Australia. This is consistent with model predictions. An enhancing hydrologic cycle, in turn, may enhance global warming, through several mechanisms. One mechanism is the water-vapor feedback, because water vapor is a key greenhouse gas. Also, increased cloudiness heats the planet, at least if the clouds are high or deep, as is the case for most storms. This is because high or deep clouds reduce the outgoing long-wave radiation more than the net incoming short-wave radiation. Although a larger global mean annual rainfall and a smaller number of frost days may have beneficial effects, especially for agriculture, the various factors listed above also have the following undesirable consequences. A reduction in snowpack can reduce the amount of meltwater which contributes to streams and lakes and which recharges groundwater, potentially reducing the amount of water available for agriculture and other uses. Hence, measurements of snowpack and estimates of snow-to-water equivalent are valuable not only for water-supply forecasting, but also for assessing potential impacts of global warming. Rising nighttime temperatures exacerbate heat waves and reduce the beneficial effects of frost in killing pests or insect-borne diseases. The positive water-vapor feedback loop may increase the rate of global warming. This response is one of the major uncertainties in climate-change prediction. Higher temperatures and heavier precipitation in winter imply more runoff and smaller mountain snowpacks in places such as the northwestern United States. In other words, both winter floods and summer water shortages are expected to become more frequent and intense. More surface reservoirs will be needed to handle both pressures, yet the building or even the maintenance of dams is facing increasing opposition, often from environmental groups. Higher rainfall intensities imply more frequent floods, and require more expensive flood-control measures. An increase in rainfall intensity also may be detrimental to agriculture, because it causes more soil erosion and implies relatively less soil infiltration. More inclement storms, mainly in winter, increases the risk of hazards along shorelines, especially as more people live near the coast. SEE ALSO Coastal Waters Management ; Floodplain Management ; Glaciers, Ice Sheets, AND Climate Change ; Global Warming and Glaciers ; Global Warming and the Ocean ; Hydrologic Cycle ; Ice at Sea ; Sea LE VEL . Bates, J. J., X. Wu, and D. L. Jackson. "Interannual Variability of Upper-Tropospheric Water Vapor Band Brightness Temperature." Journal of Climate 9 (1996): 427–438. Fowler, A. M., and K. T. Hennessy. "Potential Impacts of Global Warming on the Frequency and Magnitude of Heavy Precipitation." Natural Hazards 11 (1995): 283–303. Groisman, P. et al. "Changes in the Probability of Heavy Precipitation: Important Indicators of Climatic Change." 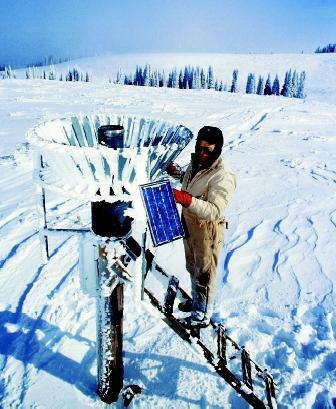 Climatic Change 42 (1999):243–283. Huang, J., and H. M. van den Dool. "Monthly Precipitation-Temperature Relations and Temperature Prediction over the United States." Journal of Climate 6 (1993): 1111–1132. Hulme M. "Estimating Global Changes in Precipitation." Weather 50 (1995):36–45. Karl, T. et al. "A New Perspective on Recent Global Warming: Asymmetric Trends of Daily Maximum and Minimum Temperature." Bulletin of the American Meteorological Society 74 (1993):1007–1024. Morrissey, M. L., and N. E. Graham. "Recent Trends in Rain Gage Measurements from the Tropical Pacific: Evidence for an Enhanced Hydrologic Cycle." Bulletin of the American Meteorological Society 77 (1996):1207–1219. Yung, Y. L. et al. "Dust: A Diagnostic of the Hydrologic Cycle During the Last Glacial Maximum." Science 271 (1996):962–963.